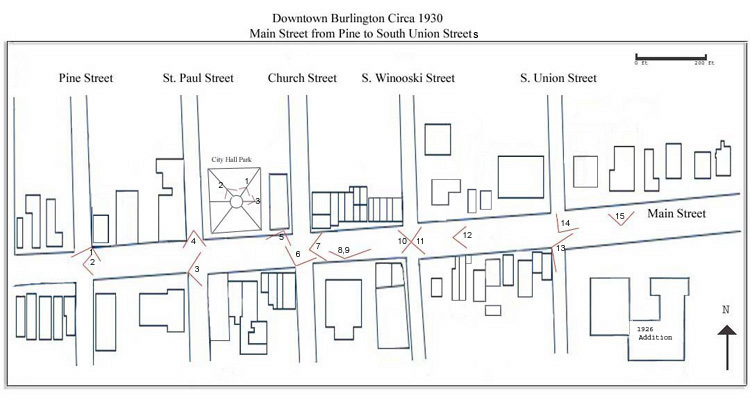 During the early part of the 20th century Louis L. McAllister documented many public works projects in the city of Burlington, VT. Many of the photographs of this area focus on two paving projects, one in 1929 when the the brick paving was covered by asphalt, and then again in the 1943 when the old streetcar rails were removed. In the graduate class, Researching Historic Sites/Structures, we compared the McAllister photos to images we took today. Many of the buildings in my area still stand today, and are either used for a similar function or have been adapted to new uses. The ones that have been lost are mostly because of fire. To access photo comparisons click on the numbers on the above map or on the list to the right.